Rain? Snow? Too Hot? Too Cold? It doesn’t matter here at Rush Hour Karting! We are an ALL INDOOR, HIGH SPEED KARTING facility. No matter what its like outside, its always race time at Rush Hour Karting! And, this is indoor racing like you’ve never seen before! We have European-designed karts that go almost 40 MPH! This indoor karting track is not like those family fun park & Putt-Putt karting tracks, oh no! The indoor karting track spans 1/3 mile, is full of hair pin curves, high speed straights, and winding turns! Looking for some fun summer activities in Raleigh when its hot outside? Check out the indoor carting excitement at Rush Hour Karting! After racing, cool down with some ice-cold refreshments in our tavern / sports bar overlooking the track! 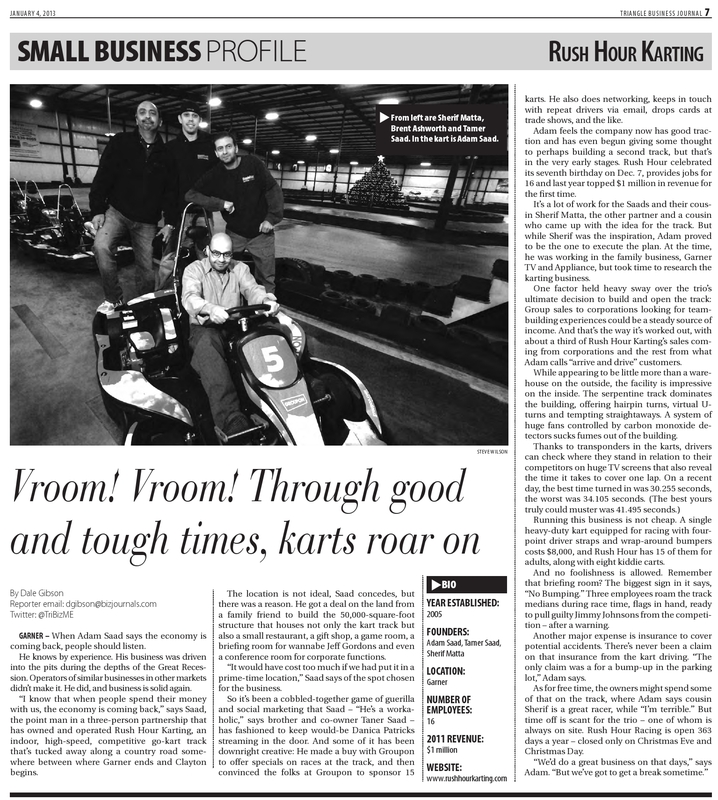 Read what the Triangle Business Journal has to say about Rush Hour Karting! Thanks so much. That was a lot of fun. Food was great. Ax throwing was even better! A “must do” again with our team. Your staff was really easy to work with too. Thanks so much for the follow up. We had a great time. People are still talking about it. A couple of people including myself, were sore the next day. The whole event was a great team building experience from start to finish. The bus was great because it made a way for the whole team to participate and stay for the entire event, which usually doesn’t happen. Now I have to try to find a way to top this event for our next meeting which will be in Columbia. I’m sure we will be back again. I personally would like to bring my family. My teenage stepsons would love it. Thank you so much for the fun and photos and please give a special thanks to your mother for the food. It was exceptionally good. We had a great time. Yes, we were sore (lol)…but it was worth it. lots of biz for you. up, racing, axes, and the bar. Professional and courteous. Awesome little outing for some of our employees. We appreciate your support during the event and your staff were exceptional. off as we were all in the top ten and had a shot for the top spot. and it is a good way to break up the day and have a little fun. option for lunch and was very good too. as well. You made my job of organizing things a lot easier! drivers ed. He wants to see if she is paying attention in class.Haha. This was my first time at Rush Hour and had a blast. My kids had been there several times and really enjoy it. There were eight in our group and we did the eight minute practice round, followed by nine minutes of qualifying and then they lined us all up for a 10 minute main event. Staff was friendly enough and safety was of utmost importance. I would definitely return. Good morning Adam, I wanted to take a moment to thank you and your staff for a GREAT team building experience for TRI. Your staff went above and beyond to accommodate us and our needs throughout the day. We appreciate your teams professionalism and attentiveness very much! Have a great day and hope to see you again in the future! Hi Adam, Our team had a great time at Rush Hour! It was the perfect event to help us forget about the stress of our jobs and bond as a team. Thank you for hosting us! Thanks, Adam. We had a great time – everyone was talking about it still last week. Everything went smoothly, and I appreciated your flexibility to make sure we had a good time. You made the planning very easy for me, too! We will definitely keep RushHour in mind when planning future events. Thank you Adam, we had a great time. You have an incredible business going, best of luck. We wish we could have driven more. We are bunch of old folks and couldn’t handle the spinning and turning. We absolutely enjoyed every second of it though. The team had a great time. Still talking about it. No doubt we will be booking the event again in the future. Adam, Thank you for the follow up. The event was GREAT! The kids had a blast, went better than I even imagined. Your staff was very flexible and accommodating—ALL of them worked extra hard to make sure our group had a good time, from the guys on the track to the girls at the front desk. You have a first class operation, and we were glad we were able to visit! Hello Adam, Thanks for following up. We had a fantastic time. And Rush Hour treated us with great hospitality. Thanks very much for providing a great time with racing and good food. Hi Adam, I wanted you to know that the entire team had a blast! It was a great experience (racing, food, service), and one that we will surely do again. My team and I had a blast yesterday at Rush Hour Karting. Your staff really took great care of us and your service was impeccable. Thank you for the team building event and I will certainly refer your service to all of my peers in other business units. We had a great time and am sure we will be returning!!! Thanks so much for a great experience. I was able to make it out last Thursday. A teller from my branch came with me to the event. We both greatly enjoyed everything that was there. The food was spectacular as well as the new meeting room and racing. That, however, was not my first time at Rush Hour. Last year, a company I was working for had their Christmas party there. I must say that the food was considerably better this visit. After talking a bit with the bartender, she mentioned that there was a recent change in ownership. It appears to me that you all are doing a fantastic job there and look forward to letting everyone know how great your place is. Thanks again for a great evening! We had a great time last week and so did the customers. We had a great time last night. Being that the Hosted Solutions team won, made it that much better!! I’m addicted man! I’m checking into the leagues out there. You may be seeing more of me that you want!! Thanks, Adam! Everyone really enjoyed it (although we were all sore on Sunday!). We will be back for sure. I am most definitely “boss of the year”! The gang had a blast … and have been talking it up with the rest of the crew here at work. (There’s about 160 in our unit … several hundred in our two buildings.) We should be able to bring you a bunch of new drivers starting next year. (We have a lot of NASCAR fans here at NCDOT, as you might imagine.) Thanks again! At RushHour Karting, our primary concern is to ensure the safety of all guests and staff. Therefore, we have mandated numerous safety precautions to ensure your experience is always safe and fun at RushHour Karting. All drivers must sign a release form before racing at RushHour Karting. Adult drivers must be at least 15 years of age. Junior racers must be at least 8 years of age and at least 48″ tall to operate the junior go-karts. A parent or guardian must sign the release form for racers less than 18 years of age. Drivers MUST wear closed toe shoes; no sandals or flip flops! RushHour Karting believes in a zero-tolerance policy regarding alcohol and controlled substances. Anyone who appears to be under the influence of alcohol or any other controlled substance will not be permitted to drive. Indoor karting is not a contact sport. We do not tolerate any bumping or blocking. The inability to pass another kart is no excuse for contact. Anyone driving aggressively without regard for our rules or the safety of others will receive a warning for the first incident. A second violation will result in the removal of the driver from the facility. All drivers must wear a helmet while driving the go-kart. Open toe shoes are not permitted. During the ride it is prohibited to leave the kart. At all times, drivers must stay in the kart and wait for track personnel instructions. If the kart becomes stuck on the track, raise your arm to signify trouble and wait for track staff to assist you. Pay attention to any flag or warning lights displayed on the track during driving sessions. The throttle pedal is under your right foot, and the brake pedal is under your left foot. The two pedals should never be applied simultaneously. For safety reasons, pregnant women; people with neck or back problems, heart conditions or seizures/epilepsy; or people who should not be in stressful or physically demanding environments should consult a doctor before participating in indoor go-kart racing. Signals the start of a race or a restart after a caution period. Indicates unsafe driving conditions on the track. Slow down, drive with caution and hold your position. Stop Immediately! The track is blocked or unsafe. A faster driver is approaching. Ease off the throttle and move out of the ideal driving line. Proceed to the pit lane immediately and wait for staff instructions. The driving session is complete. Enter the pit lane slowly.